The 1901 census is the first record of the Musgrove family after the deaths George and Emily. 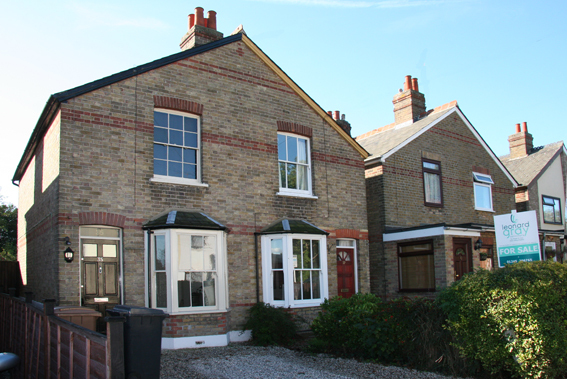 The surviving children are still living in the family home at 4 Hill Villas New Road, Broomfield (shown left is numbers 3 and 4 Hill Villas). This Census was taken one year after the death of both their father George and their eldest brother George. Herbert is now shown as in the navy, the two youngest children Roy and Rupert are still of school age. Emily is head of the family and the girls Lilly and Adelaide are not working. Also listed in the household is Louisa Langman their niece aged five. She is the daughter of Christiana and Thomas Langman and was staying with the Musgroves at this time. An interesting point is that in the same road , and shown on the census below, is Mary Ann Rice with two of her children. She is mentioned as being present at the death of George Musgrove in April 1900 quite possibly a close friend.